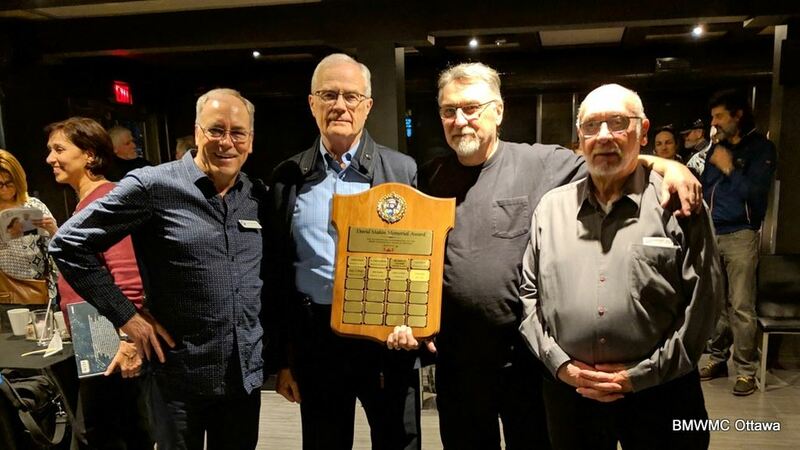 And the 2019 recipient of the David Makin award is… Tony Street! Tony has the coolest motorcycle name ever. Tony Street. Just saying it puts it in the same category with those epic silver screen motorcycle riders like Peter Fonda, Steve McQueen and Dennis Hopper. But Tony Street didn’t win the award because of his cool name alone. Many know Tony as the Club’s treasurer. What you may not know is Tony naturally assumes that role because he is an accountant. And we all know accountants measure everything with numbers. So, it is only fitting we begin by measuring Tony’s contributions to the Club the same way. 2008 - The model year of Tony’s current BMW 1200 RT. 15,000 - The longest number of KMs Tony has logged on a single continuous motorcycle journey. FIRST - Tony was the founder and inspiration behind and started the popular Club Tech Days! As compared to any balance sheet, I’m sure you agree that Tony’s numbers look impressive. But look beyond the numbers to determine the true value of an asset. Numbers alone can sometimes be deceiving. Are the fundamentals strong? Is there another form of equity there? Well, with Tony it isn’t hard to see that value either. Tony is always willing to offer advice to Club members. For example, if you want to avoid a traffic jam high in the Swiss Alps because a postal vehicle has the right of way - you seek Tony’s advice. If you need technical expertise in maintenance and repair of your motorcycle, Tony is there to help too. Having started the Club’s Tech Days, members call upon him for all kinds of help both small and big. And no job is too big. At an early Tech Day, Tony ended up working with a fellow member Chris Barnett to bore out a stripped bolt deep in the engine block! He offers guidance on Club rides and is a cherished resource. Tony has been a ride leader since he joined the Club in 2005 and nine years as co-chair of ART school. But it isn’t just the general membership that enjoys Tony’s counsel, the Board does too. Around the Board table, Tony is the voice of sober second thought. And Board decisions are stronger with Tony at the table. And it is true that Peter Fonda, Steve McQueen, Dennis Hopper and Tony Street have never won an Oscar. But unlike those other motorcycle movie idols, Tony Street can claim a David Makin Award. So just like the highly revered Oscar statue, the David Makin award is Gold in our Club. And you need not be an accountant to know that gold is an asset, and that Tony is worth his weight in it! 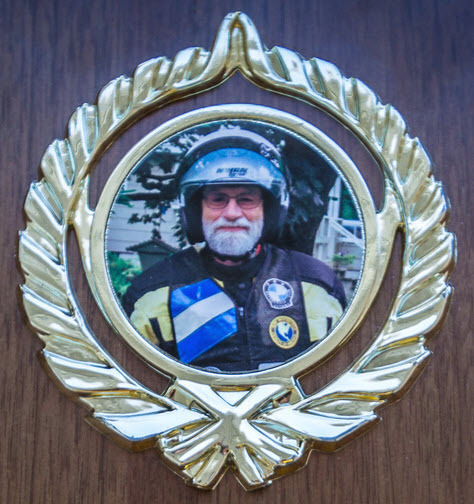 David Makin was a founding club member who willingly shared his encyclopedic knowledge of BMW motorcycles. 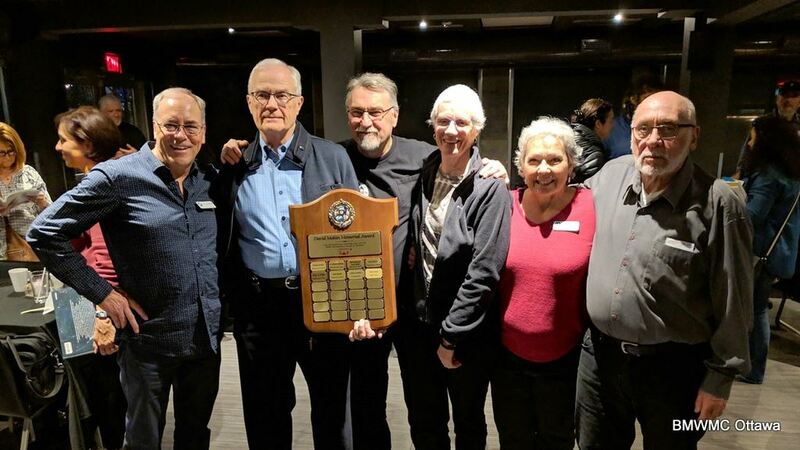 We are proud to keep David's inspirational spirit alive through the annual presentation of this Award, recognizing exemplary service that has furthered the aims of our club. Members are encouraged to nominate fellow members, at any time up to December 31st.